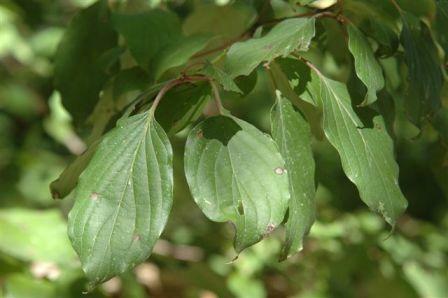 HABIT: Small tree, blooms after leaves have formed in late spring with white flower clusters. White seed pods in late summer and purple fall color. Plant spreads easily by seeds and suckers but is not a problem. Stems are reddish and very decorative in winter. CULTURE: Easy, any soil, drought tolerant. Very easy to grow. FLOWERS AND FRUIT: Small white flowers in clusters in late spring, white fruits in the fall that disappear quickly because the birds love them. BARK: Young stems are reddish becoming gray with age. FOLIAGE: Rough, hairy leaves. Fall color ranges from red to deep purple. Simple, opposite, and deciduous, 1 to 5 inches long, olive green on top, paler beneath. NATURAL HABITAT AND PREFERRED SITE: Natural habitat is the edges of thickets, streams, creeks and fence rows. Rough leaf dogwood will grow well in a range of soils from sand to clay. USES: Background mass, understory tree, seeds for birds. PROPAGATION: Extremely easy from stem cuttings, root division or seed which can be planted immediately after harvest. INSIGHT: The wood is used to make woodenware products and charcoal. The fruit is eaten by several species of wildlife. NOTES: Many have been cut down by people thinking they are weeds. This plant is graceful, tough, and should be used more. Native eastern USA to Texas.